﻿ It’s not exactly surprising that Gorillaz are releasing a new album so soon after their last one, particularly considering how their schedules have gone in the past. After all, remember The Fall, that album that came out only a year after Plastic Beach that was made entirely on Damon Albarn’s iPad, and that no one really cared about? At least Plastic Beach was decent though; The Now Now comes only a year after Humanz, the bloated, unresponsive mess of an album that tried to aim high and fell flat on its newly CGI-ed face. 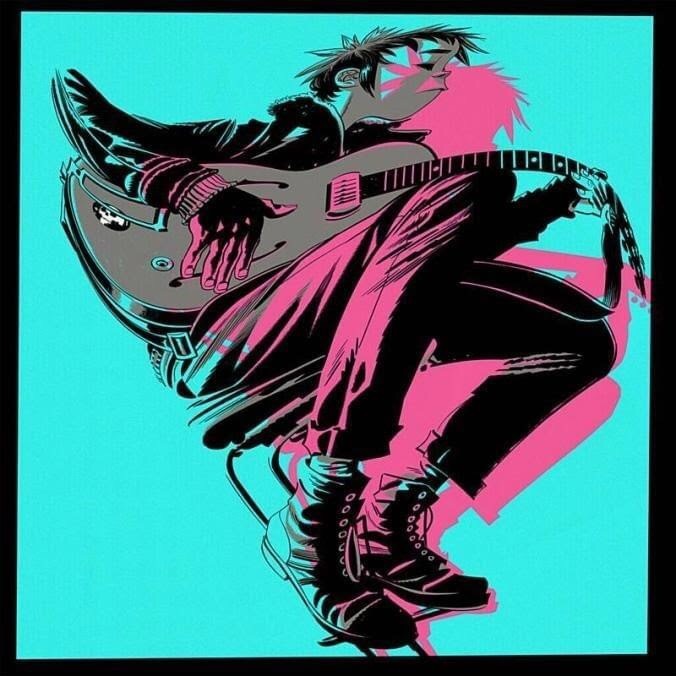 But even so, early indications of The Now Now have at least been positive, with a return to a more traditional animated style that’s always more attractive for an audio-visual project like Gorillaz (as well as furthering the lore by having bassist Murdoc jailed and replaced by Ace from The Powerpuff Girls), and re-adopting a lighter, looser electronica style in its early singles that’s characterised so many of their biggest tracks. At the very least though, stripping down the bare essentials and making that a bit more colourful is what ultimately makes The Now Now a more tolerable listen. There’s always going to be something inherently more appealing about a project like this when it’s driven by far, wobbling basslines instead of a flat hip-hop beat, and immediately, that gives a sense of fluidity to beach-funk of Humility or the digitised thrum of Lake Zurich, or especially Hollywood, giving Snoop Dogg and Jamie Principle the only vocal features to amplify the sense of G-funk cool that the warping bass already does excellently. The streamlining thanks to a drastic cut to outside influences really does make The Now Now stand out in its best moments, far more than Humanz ever did and arguably elevated to among the best individual tracks Gorillaz have released in years. On the flipside though, the lack of guest stars also means there’s more Damon Albarn to contend with, and he doesn’t seem to have moved at all from the low-energy half-presence that failed to connect at all last time. At least with a song like Tranz there’s an interesting instrumental to alleviate the focus on how goddamn boring he sounds, but then there’s Idaho and Fire Flies, which shift to an electro-freak-folk sort of sound that’s all kinds of awkward on its own, never mind how much it highlights Albarn’s underdeveloped croak that sounds like he’s singing from his deathbed. It’s pretty much the entire back half of the album too, not only smashing any possible cohesion that’s never been Gorillaz’ strong suit in the first place, but horrendously dragging on, sacrificing any source of interest for the lightness and whimsy that’s only barely mustered. Even in the lyrics, which once again take a political focus, albeit one that’s more optimistic and populist at breaking out of established systems of isolation, it has the same problems that essentially killed Humanz, in that there’s nothing done here to give that message any sort of gusto or chance to connect; like everything else, it floats in the middle zone where it can achieve absolutely nothing. That’s probably a solid analysis of Gorillaz as a whole now, a project with commendable ideas but never bothers to build on them or decide how they could be implemented effectively, rather just let them take a form for good or for ill. With The Now Now though, there’s clearly a seed of a project trying to regain some ground by pushing a bit further with the instrumentation, but it’s simply not enough, only pushing this album closer and closer to the standings of irrelevance occupied by The Fall. It’s good to see something here that potentially signifies an improvement, but for as much of a botched mess as Humanz was, it was interesting to talk about; The Now Now can’t even manage that. ‘The Now Now’ by Gorillaz is out now on Parlophone Records.